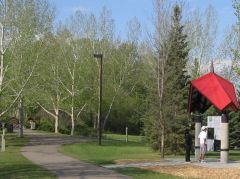 For over a century, the forerunner of the Calgary-Edmonton Trail was an important conduit of communication and movement between the open prairie and Fort Edmonton. Situated in the vast expanse of a glacier corridor, this trail - a segment of the Old North Trail - was a natural pathway. To the east dense forests, to the west, gently rolling hills. Indian trails running south from Edmonton had long been adapted and used sporadically by early explorers and itinerant traders. In 1858, the Palliser Expedition camped at an area known as Cache Camp - later called Poplar Grove and today known as Innisfail. It wasn't until 1873 that a "civilized" trail between Calgary and Edmonton came into being when the Reverend John McDougall, a Methodist missionary, and his brother David, a free trader, built a mission at Morley. They cut a formidable path for their cart train and livestock from Fort Edmonton through the Peace and Bear Hills to the crossing at Red Deer and then to the Lone Pine stopping house thirty miles south. From Lone Pine (near present day Bowden) they veered westward up the Little Red Deer River Valley then down the Ghost River to the Morley site on the Bow River, some fifty miles upstream from Calgary. When Fort Calgary was built two years later, the trail from Lone Pine was extended due south along what is now modern Highway 2. The Calgary-Edmonton Trail became a vital extension to the expanding marketplace of the American traders during the 1870s and 1880s. Once the North West Mounted Police eradicated the whiskey forts, of course the whiskey traffic didn't stop, but continued clandestinely in barrels labeled "Coal Oil". 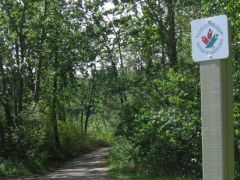 Though the Trail was originally blazed from Lone Pine to Calgary by the Hudson's Bay Company, the I.G. Baker Company from Fort Benton, Montana, soon dominated the burgeoning pioneer market. The Hudson's Bay Company and other Canadian traders were forced to transport goods from Winnipeg up the North Saskatchewan or lug them by cart over the Carlton Trail to Edmonton, then south over the Calgary-Edmonton Trail. American traders freighted considerably more cheaply from the east along the Missouri River to Fort Benton, then by wagon over the Old North Trail to Fort Macleod and Calgary. The Calgary-Edmonton trail made for an expedient northern extension to this network. As the link between economic domains, the Calgary-Edmonton Trail became firmly established as the pre-eminent artery in what would become Alberta. By 1888, travellers freely ventured this well-beaten path in whatever conveyance they found suitable. Among these, the Red River cart was superior transport, quite adaptable for use on the varying terrain. It was soon discovered that heavier wagons, though functional on solid prairie ground, were poorly suited to the rich black soils of central and northern Alberta. Stagecoaches were more "stage" than "coach". Patrons soon grew accustomed to the unnerving experience of having to sit in the back of wagons covered with canvas and crowded with freight. A sudden stop called for a quick escape out the back. Though the trail accommodated commercial traffic for many years, few settlers inhabited the surrounding land until the Canadian Pacific Railway reached Calgary in 1883. The iron horse ushered in a boom period for the trail to Edmonton, as Canadian supplies were shipped to Calgary via rail and then dispersed over this sole link with Northern Alberta. The railroad also pushed back the American interlopers. The trail to Edmonton soon became one of the busiest roads in all the Dominion, carrying about nine-tenths of the supplies, mail and people that were freighted northward. The Edmonton Bulletin reported in 1881 that about 363 settlers had peopled the land between Calgary and Edmonton. Just two years later, the area was populated enough to warrant regular mail service between the two cities. Ad McPherson and John Coleman were awarded the contract to carry the Royal Mail, light freight and occasional passengers. Later that year, Donald McLeod started the first weekly stagecoach service. The stage would leave Jasper House, Edmonton, at 9:00 a.m. and the steamboat dock at 9:30 every Monday, making stops at Wetaskiwin (then Peace Hills), Ponoka (then Battle River), Red Deer Crossing and Willow Creek (in the Olds area), arriving in Calgary the following Friday if all went well. Freight wagons took considerably longer - up to 14 days, depending on the weather conditions. The trail was often mired and deeply rutted. Frequent flooding and blizzards stalled travel. "In view of the great traffic and immense travel which some day may be done this way my intention was to make the road as straight as the actual direction of the trail between the two extreme points would allow. A little ditching, a small culvert, a slight cut or a few branches thrown on a soft spot will be all that will be needed to keep the trail open." In 1891, the Calgary and Edmonton Railroad was completed, much to the consternation of Edmontonians who were distressed that the Canadian Pacific Railway Company was reluctant to cross the North Saskatchewan River. As a result, the new town of Strathcona sprang into being, drawing even more commerce away from Edmonton proper. By 1885, the trail was well-populated and a number of stopping houses sprang up to service customers. Many became sidings of the Calgary-Edmonton railway, and later evolved into full fledged towns and cities.